It seems like once the weather cools down everyone wants to jump right into pumpkin season. Don’t get me wrong, I love pumpkin as much as anyone else, but to me September is apple season. I was thinking about how often apples get overshadowed by pumpkin a few weeks ago when my husband asked me if I wanted to attend a dinner party with some of his coworkers. “Hrmmm. Maybe…”, I said. “They asked us to bring some kind of food to share”, he said. That was all I needed to hear. Not one to pass up an opportunity, I agreed, “I’ll go… but only if I can bring dessert.” I had visions of apples and caramel and cupcakes swirling in my head. It took me a while to decide on an approach for these cupcakes. Did I want apple cupcakes with caramel frosting? 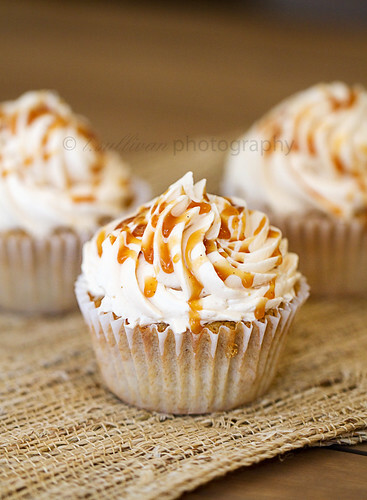 Caramel cupcakes with apple frosting? Would there be enough apple flavor? I was imagining cupcakes that tasted like apple pie (but without the yucky crust) so they really needed to taste like apples. Ultimately, I decided the best way to pack that punch of apple flavor into a cupcake was to use apple pie filling. Cinnamon cupcakes would compliment the apple filling without overwhelming it, and caramel frosting would be the icing on the cake (ha ha). I was apprehensive while putting these cupcakes together. I’m not going to lie – they’re pretty labor intensive and not exactly easy. I had doubts about whether they would be worth all the effort, whether they would taste as good as I imagined they would. In the end, they didn’t. They tasted approximately a million times better than I had imagined. I was hoping for good cupcakes, but these were amazing. Fantastic. They got rave reviews at the party, but I thought maybe everyone was just being nice. Until I tasted one myself. I believe I uttered the phrase, “OMG. These are my new favorite cupcakes ever… and they’re not even chocolate!” So yeah. They’re that good. Totally worth every minute they took to create. You won’t find cupcakes like this in a box at the grocery store! There are several steps to complete before assembling the cupcakes, but some can be done a day ahead to speed things up. The caramel and apple filling can both be made 1 day ahead and refrigerated. Let them come to room temperature (or gently warm caramel) before using. You won’t need the whole batch of caramel, so feel free to half it if you don’t want a bunch leftover. Any leftover pie filling or caramel sauce makes a fantastic breakfast/snack mixed with Greek yogurt, or a delicious topping for ice cream! Working with completely cooled, use a small paring knife to cut out a cone shaped wedge from the center of each cupcake. (Like when cutting the lid off of a jack-o-lantern.) Save the “lids”. If needed, scrape out a little bit of cake from each hole to make more room for filling – just don’t go too far or your cupcakes will fall apart. Fill each hole not quite to the top with Apple Filling (about 1/2 tablespoon). Replace “lids”, trimming off the bottoms of the “lids” if necessary. Pipe frosting on cupcakes. Drizzle with caramel sauce. Serve same day as assembled, or freeze for long term storage. A word of caution: Making caramel is tricky. Have patience and have all of your ingredients ready to go. Caramel also gets very, very hot. Much hotter than boiling water. It will spatter, so be careful. Wear long sleeves, use a deep pan or pot, and do not try to taste the hot caramel no matter how much you want to! David Lebovitz has some great tips for making caramel. Measure heavy cream in a measuring cup. Scrape out vanilla bean seeds and add to cream. Set aside. Spread sugar in an even layer on the bottom of a heavy, tall-sided sauce pan or pot. Cook over medium-low heat, stirring gently with a heat-proof spatula or whisk to promote even browning, until sugar melts. Once the sugar comes to a boil, stop stirring. Watch carefully. When the caramel turns a rich amber color and smells like caramel, remove from heat and immediately whisk in cream. (Caution: Caramel will bubble violently!) If any sugar has hardened, return to low heat and whisk until smooth. Cool to room temperature. To store or make ahead, transfer to an air-tight container and keep refrigerated. Caramel can be re-warmed in microwave or in a saucepan over low heat, if needed. It’s very important that your caramel be no warmer than room temperature when you add it to the frosting, or your frosting will melt. These sound (and look) fantastic! I’ve got an apple tree outside my living room window just desperate for me to do something with its lovely fruit….these are a lovely idea. Thanks for sharing! Holy wow! These sound amazing! These would even make a nice alt Thanksgiving dessert. Wow, these sound wonderful. You weren’t kidding that it has a lot of steps but it definitely sounds worth it. I LOVE the idea of putting apple pie filling in the cinnamon cupcakes. Wow! These are impressive. Love the creativity! These look amazing! I always start to think about apples in October, it’s when picking season starts in the orchards in the mountains near me. I hope to get up there this year, partly for the apples, partly for some wine tasting! Very creative. Love to see this. These are beautiful and worth EVERY single step! Sounds and looks SO YUM! I would love that great surprise in the middle of the cinnamon cupcake! So is SMBC your favorite type of icing? I notice you use it often. I made a raspberrySMBC the other day that was so YUM! I like that it is not TOO sweet. I made a cake off of Annie’s Eats. That’s a delectable cupcakes and the flavor combination makes it perfect to entice my choosy kids. I would love to learn the multiple procedures of this. These sound delicious so I can only imagine how the tasted ! The “yucky crust” of an apple pie?? That’s almost the best part!! ;) this recipe looks awesome. I think I will attempt to make them w a pie crust bottom. Sorry, I’m a pie crust hater ;) But let me know how that goes! All my favorite flavors in cupcake form! Thanks for the incredible recipe. These look absolutely amazing, and make me want to get a stand mixer even more so that I can make the swiss buttercream. Somehow I don’t think my dinky little hand mixer is up to the challenge. These definitely look well worth the effort! Wow, these look amazing. I just stumbled upon your blog and this will easily be one my of daily reads:) Beautiful photos btw! These sound delicious. I will have to give them a try for sure! Thanks for sharing the recipe! Your cupcakes look so gorgeous, almost to good to eat! I so need to make them, but I doubt I”d get mine to look as nice as yours! I just made these and they are amazing. I baked the filling right in with the cupcakes instead of coring the cupcakes. holeyyyy shmoley. they look amazing. WISH I could make them and keep them in the house- but I’d be FAR to tempted to eat them ALL in 1 sitting! These look AWESOME. However, I can only imagine myself in a kitchen filled with bowls, flour, and sticky caramel after trying a complicated recipe like this! I’ll leave this one to the experts. I’d buy some from you, though :) Looks delicious!! Hi..the cupcakes look wonderful!..I was wondering about the carmel sauce.. Its been a long time since I made carmel candy, but does the recipe say to melt the sugar in the pan alone, without any liquid added? Please excuse me if I read it incorrectly..thanks! Yes, that’s right. It’s called a “dry” caramel (as opposed to “wet” caramel, where the sugar is dissolved in water before melting). My dad would love these cupcakes. His birthday is coming up! Maybe after we visit the apple orchard I will make these for him. He always makes my birthday cake…it would be fun to surprise him this year! Oh my gosh! Those look amazing! So i tried making this but the butter cream didnt come out…it was mor of an icing than a buttercream lol..any suggestions?? What do you mean when you say your buttercream came out more like icing? Do you mean it was runny? If it was too soupy / runny, your butter or caramel may have been too warm. When that happens, you can set the buttercream in the fridge to chill for about 15 minutes, then try beating it smooth again. If it’s still too runny, keep chilling for 15 minutes and beating until it firms up. As long as you beat it to a stiff meringue in the beginning, Swiss meringue buttercream can almost always be salvaged. It usually either needs more chilling (if it’s runny) or more beating (if it curdles). Those sound deliciously sweet. I love caramel! These look delicious. It sounds like the perfect fall treat. Wow, these would be really wonderful with a cup of hot tea or coffee. Great contribution! Does the sugar in the caramel sauce get real hard and chunky before it melts? The sugar does tend to kind of clump up at first. Stir it gently to keep any spots from burning, and as it heats it will eventually turn to liquid. If you add the cream too soon the sugar may harden again. If that happens, just put it back over low heat and stir until it melts again. That picture looks soooo mouthwatering!! The cinammon cake itself looks absolutely delicious, much less the frosting and caramel drizzle! If I could reach into my computer and eat one of these, I totally would. I am so interested to try these. 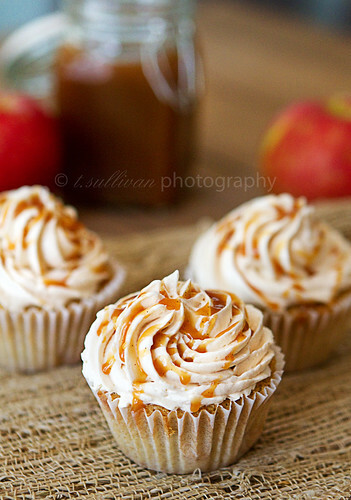 Apples in a cupcake are definitely something new! Oh yum…I wish I had one now. I love caramel and apple…well, who doesn’t though huh? Very nice. Yum! What a great idea. Thanks for sharing! I’ve just made these cakes, they’re awful! There’s far too much egg, they’ve come out like eggy cinnamon messes, and before anyone says, it’s definitely not my baking skills. Oh my goodness, those look amazing!!! Awesome photos and great recipe! Thanks for sharing and have a wonderful night! I went apple picking with my family this weekend and have an abundance of apples that I need to use up before they go bad and I have been searching the internet and making anything and everything apple. I see this recipe and I needed to try it…we had a charity bake sale at work today so it was a perfect excuse for me to make them. I must say that they were extremly labor intensive however, the results were AMAZING!?!?!?!?!? Definetely going to make them again. I am in the process of making these. The filling and sauce are done I will do the icing and cakes today. My question is this. I need to travel 6 hours with these. I am thinking I will not assemble them till I arrive to make life easier, but will the icing melt if I put it in a cooler bag with an icepack? Also, If I make these and put them together today early afternoon, Will they be soggy for a party tomorrow night? Crys, check your email for my answers to your questions :) The short answer is that the frosting and the cupcakes should hold up just fine at room temperature for at least 24 hours. 2 batches of frosting down. I gave up and used the last one. The 1st looked awful, like I mixed sand into it, although smooth between my fingersand still runny. The second had large lumps and was runny, even after putting both batches back into the freezer for a 15 to chill again. Regardless I had my cupcake tops just below the paper line and used it as a “rim” to hold the frosting in. I spooned it in and drizzled with the Caramel sauce. I added cinnamon sprinkles from pampered chef for texture and eye appeal (since the frosting was lacking due to my inexperience). My kids (1 & 2) love them!! Can’t wait till my husband gets home to try them. Storing in the freezer till a couple hours before I can get them to the party so the icing doesn’t run off !!! Despite the problems I had with the frosting they got RAVE reviews!!! THANKYOU!! 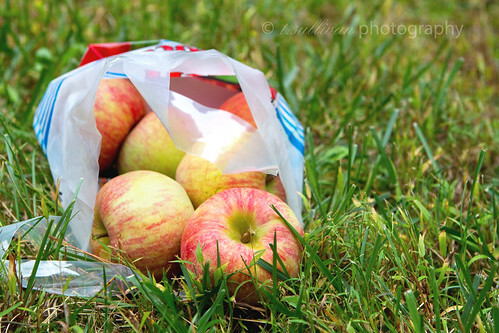 These sound wonderful, this is apple season and I am trying new recipes from all the apples I have here, just picked up 2 bushels from the orchard Sat. and made 1 bushel into apple butter, next will try your cupcakes! Can the cupcakes be made a day ahead as well? The cake part of the cupcakes can definitely be made a day ahead. Store covered at room temperature. Just to be safe I’d frost them the same day you’re going to eat them, but it should be fine either way. I ate a completed (frosting and all) cupcake that had been refrigerated overnight a whole 24 hours after I made them and it still tasted fantastic! Just be sure to let them come to room temp before eating, to get the best frosting texture. Oh my goodness, I think these look too beautiful to eat. Well, almost… I could probably do it. Came in via google, and am considering these for one of the Thanksgiving desserts. I’m wondering how the filling turns out, texture-wise. Every fall we do a big apple-picking trip (just last week) and so I’m used to freezing several containers of apple pie filling. Is the idea to cook this filling down as much as traditional apple pie filling, and how do you think it will freeze? Freezing cakes always makes me nervous so I’d rather bake those just before serving, but if I could use the apples we already have to make some of the filling for these, that would be ideal. These look amazing. Thanks so much! I just made these for a party we were going to. Everyone was raving about them. My frosting and caramel were a bit thinner than I would have liked, but I didn’t have anymore time to fuss with them. Don’t know if I will make them again unless I have a LOT of time. They were worth the time and delicious. I only had one bite of my son’s because there were no more left. I tried this recipe! I think I nailed it, but I think I overcooked the caramel because I lacked a suitable pot; I used a deep cast iron skillet and I think the heat carried through longer than it should have (the caramel came out slightly bitter and coffee tasting, but not terrible). I used the caramel in the frosting, but I placed some leftover apple bits from the filling and cinnamon on the top instead. But you are right! It is very labor intensive! Be prepared to do this project over at least two days (it took me three!). One for making the apple filling and caramel, the next for baking the cupcakes, and the third for hollowing out and filling the cupcakes and making the frosting. Okay… I just finished the cupcakes, it took me longer than expected, i don’t have a mixer so i did it all by hand. questions: is the sticky meringue supposed to be quite solid, or is it liquid? because i understood that it had to be, i.e., like the meringue in the lemon pie, but i couldn’t get that. Finally I chose to put some apples on top as well, following one idea in a comment. Yes, the meringue stage of the frosting should be similar to what goes on top of a lemon pie – almost like marshmallow fluff in consistency. It’s probably next to impossible to do by hand. It requires a lot of beating! I just made these and they turned out amazing! A great treat for Halloween :) We live in Korea so a taste of back home during the holidays was just what we needed. Thanks so much for the recipe! The best! I did a third of the caramel recipe, and put a 1/2 cup of sugar in a small saucepan to melt on low heat, only shaking pan to stir (I tried 6 times before I figured this out). Also, the icing works fine without a candy thermometer; just take off the heat when white fluff forms on the top. I made a half batch of the batter, with a full batch of the apples, which made enough for 2 dozen mini muffins…perfect! These will be my go-to for a while! Your photos are gorgeous and I love that the recipe is truly homemade. I hate when a recipe calls for caramel candies…yuck. I love REAL caramel. Worth the effort for sure!